Talking Tip #7: Heed his effort to make amends. John Gottman also noticed that in healthy relationships, one person often reverses the flow of negative communication by attempting to say something conciliatory. Then the other person acknowledges it and becomes more conciliatory in return. For instance, after fighting for a while, one person might say, “Well, I suppose there’s something to what you’re saying” or “I think we both do that [admitting culpability]. Hearing the attempt to diffuse anger, the other person might make a U-turn and be more positive in kind. In unhealthy relationships, if one person says, “I admit it, you’re right about that,” the other person might be so angry he or she will be oblivious to the comment and just keep going. In other words, repair attempts go unnoticed. A word to the wise. If you and your partner are in the midst of a heated conversation and he says something even mildly positive, acknowledge it. Any effort on his part to get things back on track is effort worth reinforcing. You want to catch him in the act of getting it right – being conciliatory – and underlining it, remember? Don’t allow the heat of the moment to deter you from doing what will be more helpful to you in the long run. The next time you have a fight, listen very carefully to what your partner is saying. Look for the small signs that he’s trying to make up with you. Talking Tip #8: Acknowledge his position and feelings. The premier communication principle is this: Seek to understand before you seek to be understood. When people feel understood, they’re much more cooperative and conciliatory. When couples argue, most of the time it’s a debate about who’s right and who’s wrong. Neither person is really listening. We’re too intent on making our points. Little effort is put into trying to make sense of the other person’s point of view. That’s when conversations get very destructive. If you’re someone who can’t believe how stubbornly your man clings to his way of looking at things, I’m going to tell you something that works like magic during heated confrontations. If you want your partner to cooperate with you, to understand your point of view, to appreciate how you might be feeling about something, there are two things you need to do. The first: Really listen to what he’s saying. Now you might be wondering what I mean by that. I’m not just saying that you hear the words that are being spoken, I’m saying that you truly try to understand your partner’s point of view. put yourself into his shoes. You don’t have to agree with his opinion, but you should make a concerted effort to understand why he might be feeling that way. The second step: Tell your partner that you understand what he’s saying. Check out whether he thinks you grasp his point. Agitated people often become calm, conciliatory, and cooperative when they feel understood. But there’s another reason that acknowledging your partner’s point of view often leads to more positive outcomes. There is one all-too-common problem-solving strategy that I see repeated more than any other – doing more of the same. When we keep stating our position over and over, that’s exactly what we’re doing – more of the same. But when we acknowledge our partners’ points of view, not only are we demonstrating that we understand them, we’re also stopping a bad habit. We’re doing something different. Some time ago, my husband and I were out to dinner and we were having a really pleasant time when I decided to discuss the purchasing of a new car. Although I felt certain that I had finally decided what kind of car I wanted, I thought it would be a good idea to discuss my decision with him. I had tentatively decided on a sedan that was a bit more upscale than my usual style. When I shared my choice with him, he immediately suggested I get a more practical car, like a Jeep. Oddly enough, although I’m not particularly picky about the kind of car I drive, the more he favored practicality, the more I leaned toward overindulgence. As our conversation got more heated, I realized we were ruining a perfectly lovely evening together, and I also realized that, down deep, I don’t care all that much about cars, I just like reliable transportation. Once he said that, something mysterious happened. I didn’t care at all what kind of car I bought. All I knew was that it felt great that he was considering my feelings. And I know why he so – he felt good that I had considered his. If you’ve ever felt your partner is stubborn and that arguments have gotten blow up way out of proportion, it may be because you and your partner have ignored this one little rule: Conflict resolution begins the moment people feel understood. Listening is an act of loving, and when you give love, you’ll get love in return. Talking Tip #9: Ignore the zingers. Unless they’re attorneys, men complain that their women are so much more adept at arguing than they are. Many men feel women run circles around them verbally. To even out the score, guys often throw zingers. Zingers are sarcastic comments that don’t feel very good to say the least. If you want your conversation to go downhill at lightning speed, throw a zinger right back at him. But I say, you be the big one. Know that the main reason he’s hurling a hurtful comment at you is that he feels threatened in some way. He’s trying to protect himself, and although being mean isn’t a healthy or fair way to protect oneself, for that moment it’s his way. But regardless of what he does or says, you have a choice. You can stoop to his level or you can take the high road. To take the high road, you can do a number of things, the most obvious of which is to just ignore him and keep going. If you’re new to this ignoring thing, he’ll be surprised that he didn’t push your button, and he might even challenge you again. Throwing zingers is only one of many ways he tries to derail you. He has other methods for pushing your buttons. By now, you should know what they are. That’s when it takes a great deal of self control to deflect his comments. But it can be done. Once he sees he’s not getting you to react, he’ll eventually stop testing you. Regardless of his method of choice, always remember that ignore him will work in your favor. When you ignore his zingers, you’ll feel good about yourself. You’ll feel as if your life is in your control. This is all really good stuff, but there’s also icing on the cake. You should notice that by detouring around his zingers, your arguments won’t get destructive. In fact, they might even be productive. It may not happen overnight, but if you’re patient, eventually he should come around. Now maybe you’re thinking, “Michele, that sounds like a good idea, but how in the world do I stop myself from blasting him if he’s nasty to me?” First of all, you have to feel convinced that it’s your choice. I already told you that you’re in charge of what you say, no matter what he says to you and no matter how his zingers make you feel. Even if you’re furious, you still have to decide what you do about it. Feelings don’t force us to act certain ways. We decide how we’re going to act and react. Second, you probably know exactly when he’s about to spout something ridiculous or hurtful. My guess is that you even know what he’s going to say. Being able to predict this stuff doesn’t lessen the sting when it happens, but it does prepare you for its occurrence. And since you know it’s coming, you can take a deep breath, count to three (or one hundred, if you have to), and calmly continue with what you were saying before he interrupted. Just keep telling yourself, “Don’t react. It’s not worth it.” If you really set your mind to it, you can do it. I know you can. Remember, you’re changing your steps in the dance of conflict to get better results! Have you and your partner ever been in a heated conversation and in the midst of things, your man checks out? His eyes glaze over. He stops talking. He looks away. He utters, “You’re right, you’re always right. I’m always wrong.” All meaningful conversation comes to an abrupt halt. Or in the middle of an emotionally charged discussion, does he walk out of the room or leave the house? There’s a name for what your man is doing. Researchers John Gottman and Robert Levenson call it “stonewalling.” Lots of men do it. And when I tell you why, you’ll probably be surprised. The researchers asked the couples to discuss a major area of disagreement in their marriage. Throughout their conversations, these couples were videotaped and monitored for physiological arousal. Heart rate, blood velocity, skin conductance, and gross motor movements were tracked. The data suggested that during conflict, men become significantly more aroused physiologically than women. This allows women to tolerate longer, escalating rounds of conflict. Men need to lower their arousal because if they don’t, they might feel overwhelmed and lose control. Stonewalling protects both partners from this sort of escalation. Furthermore, it takes men longer than women to recover from being worked up physiologically. Even though you now know there are physiological reasons for your man’s tuning you out, you may not feel any better about him when he does it. But you should know that he’s not doing it to make you angry, he’s trying to soothe himself. He needs the downtime. Since many men really do need time to de-escalate, it’s often helpful to build in a time-out period when you have heated discussion. If you see your partner stonewalling, you can suggest that you stop talking about things for a while. You may decide to separate or just do something entirely different. You can have a predetermined time-out period, or you can make it more open-ended. If it’s open-ended, wait a while and then ask your partner if he’s ready to talk. Honor his feedback, and if he’s not quite ready, set another appointment to finish your conversation. Or, if you’d like, decide that you’ve gone as far as you will go on that particular subject and drop it. You may think that instituting a time-out period during heated debates is too artificial for you. That’s okay. The most important thing for you to remember is that if your man walks out of the room or tells you to leave him alone for a while, there’s a good reason for it. He’s not just being difficult. He needs to settle down. Your conversations will not be a good one if you keep going when he’s highly agitated. So whatever you do, don’t pursue him no matter how angry you are. A time-out period can give both of you a chance to clear your heads and approach each other in a more level-headed manner. Give it a shot. Talking Tip #11: To cry or not to cry, that is the question. A short but sweet tip. Some women tell me that when they’re arguing and they become emotional and cry, their partners tune them out, get angry, or leave the room. Other women say that their tears make their men soften. So I have a suggestion: Once again, keep your eyes on the cheese. If your becoming emotional- crying, being sad, looking despondent – triggers your man to be more sensitive to you, then let it all hang out. If your emotional side makes him become less cooperative and angry, get a grip. Let your feelings out with a good friend instead. I’m not saying you should manufacture feelings or pretend you don’t have feelings when you do, but I’m suggesting that you keep your end goal in mind no matter what you’re feeling. 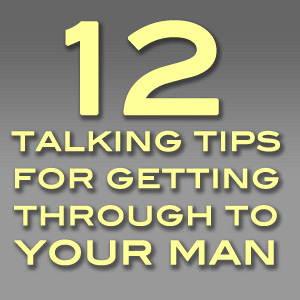 Talking Tip #12: Unless he’s deaf, he heard you. It took me lots of years to figure this one out, and I want to spare you the exasperation. Long ago, when Jim and I argued about something, I would keep at it until he either agreed or acknowledged what I was saying. More often than not, I didn’t get what I was looking for. I had chronic frustration. But as I got older and wiser, I noticed something interesting. Even though Jim didn’t agree with me (in fact, he usually vehemently disagreed with me), in the days that followed, his behavior changed. He started doing what I asked of him. That’s when I realized that my microscope was too narrowly focused. I was looking for understanding and cooperation within the time frame of our conversation only. If he didn’t verbally commit to pleasing me, I felt I hadn’t gotten through to him and I was angry. Since I now know that, even if he tells me I’m crazy and that there’s no way in hell he’s going to do something, I don’t jump to any conclusions. I know from years of experience that when he’s had a chance to cool down, he might just change that stubborn little mind of his. He often does. If your man is fanatical about self-determination like Jim, it’s much more likely that he’ll come around after you’ve stopped trying to convince him. Then if he complies, he’s doing it because he wants to, not because you told him to. He’s saving face. So don’t think if you haven’t reached an agreement during your talk with him that he isn’t listening or hasn’t heard. Unless he’s deaf, he hears you. Stop pressing your point (and don’t feel bad about it); step back for a few days and watch for signs that he’s mellowing. Be patient. Guys are slow learners. It takes time for good ideas to catch on. So now you’re armed with lots of tools for influencing the man in your life to be a better partner. And when he’s less than wonderful and you need to talk with him about it, you can make your life easier by taking the talking tips to heart. This entry was posted in Uncategorized and tagged communication tips, divorce, Gottman, love advice, marriage. Bookmark the permalink.